Macy’s sets the stage by introducing a short story about Lucy, the Head of the United States Space Program in 1969, who discovered a planet she named, Paradisos. She employs her former schoolmate, R.H. (who just so happens to be the great-great-great-grandson of Macy’s founder) to fly a spaceship coined the Starflower 1 to Paradisios and explore it. When he crash landed on the planet, he was unhurt and found by fuzzy creatures called Paradigms. The Paradigms mischievously guided R.H. to underground tunnels called The Caverns where they encountered an octopus-like monster called the Paradox. R.H. and the Paradigms were able to assuage the Paradox and made it to the Floating City, where R.H. saw the magical red flowers that power the planet. After that, the Paradigms continued showing R.H. the planet and they explored it for a couple of weeks. The entire time, R.H. kept a journal to draw and document what he saw. Upon his safe arrival back to Earth, he gave Lucy the journal for safekeeping, though visited once in a while for inspiration for Macy’s Department Stores. Throughout the New York City Macy’s Store’s main floor, Paradisios is depicted. Walking in, the first thing that one sees is the Starflower 1 soaring towards the ceiling amid flames and flowers below it. Every column on the main floor was decked out in brightly colored flowers. A recreation of the International Space Station hung in the air, a visual marker for those traveling to Paradisios because the two are not far from each other. Archways were assembled and the tops of them all held plants and one held the Paradox monster. In the middle of the floor, there was a sculpture of the Spidercrawler rover that R.H. used to explore the planet, but it was completely filled by the Paradigms. Hanging from the ceiling by the escalators were spectacular planets and lastly, a sculpture of Paradisios at the end. Macy’s Flower Show was created by the same people who plan and create the Macy’s Thanksgiving Parade every year. This team did a stellar job putting on this show, Journey to Paradisios and truly made the visitors feel like they were in a space exhibit. Each flora and fauna creation, the spaceship and space station, even the Paradox and Paradigms, were all so exquisitely made. Focusing on the main floor of Macy’s, rather than spreading the show throughout the store was somewhat disappointing at first because it seemed so small, but walking through it (twice!) actually revealed that it made perfect sense. One more confined area made it easier to forge the atmosphere of being in space and on this new planet. A more widespread show would have had to have been consistent and intricate to feel embraced by the show. 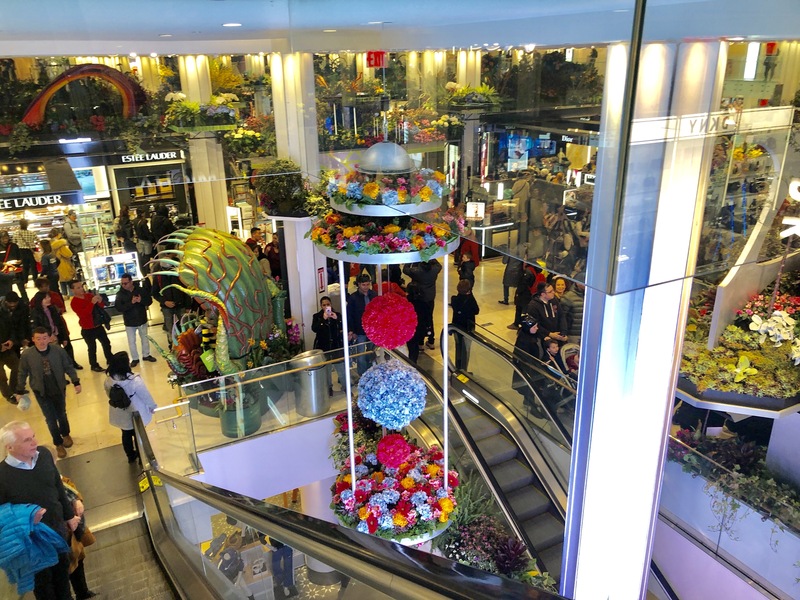 All in all, Macy’s did a phenomenal job designing and actualizing a whole new environment for their 2019 Flower Show. It is a shame that they only keep it up for two weeks, though I am sure I am not the only one who is already eagerly awaiting next year’s show!